Oreo is a black-and-white stray cat that once wandered into a nursing home and had no idea that it would be her forever home. 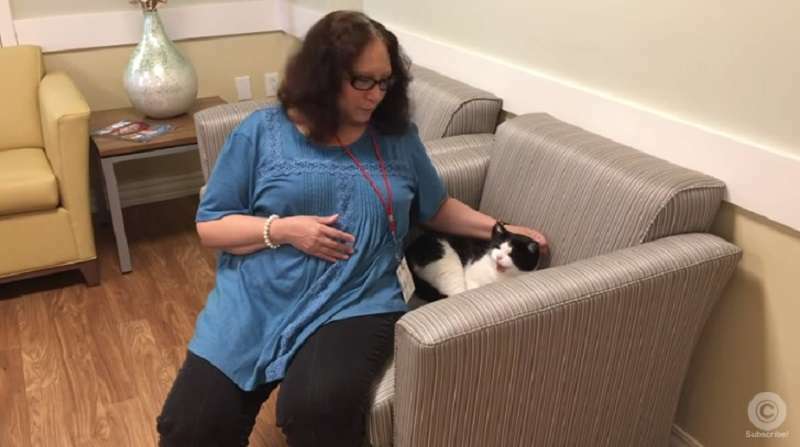 While speaking to Cleveland, Dana Carns, director of the St. Augustine Health Ministries in Ohio, said that the cat's presence has been very beneficial to the residents of the home. She explained that many of the residents grew up with pets but, unfortunately, some were not able to bring their beloved animals with them. Having Oreo around gives them a feeling of home. The cat, believed to be a stray, strolled casually into the facility and has now become indispensable to both staff and residents. Everyone loves having her around and it looks like Oreo loves her new home as well. Apart from providing comfort and entertainment to those who need it, it sure looks like the cat is pitching in in other areas as well. Just look at her stern expression behind the reception desk. The caring little feline has managed to encourage everyone to come out and interact with her. She has brought smiles to people's faces and nobody can stop raving about what a good cat she is. The receptionist at the facility, Carmen Delgado, describes Oreo as part of the family at the nursing home. One of the residents, Susan Owen, also has lovely things to say about Oreo. Apparently, one of her favorite things about the cat is her black-and-white color. And Owen does not mind hanging around the kitty from time to time. A video of the cat interacting with resident and employees alike in the nursing home is absolutely a delight to see. All facilities like this would probably benefit greatly from having such a lovely creature around to brightens up the place and people's heart.